Tasmanian strawberry growers, D M Jennings and Sons deliver quality produce, with help from a Croplands Equipment Quantum Mist sprayer. This specially-designed unit is making a name for itself by working in leafy ground crops such as strawberries, also certain vegetables. The Tasmanian strawberry season gets into its stride in about October, winding down in May with the peak months of November, December and January requiring mist sprayers to perform without missing a beat. Dave Jennings says their high-tech Quantum Mist sprayer has been instrumental in the venture being able to pare back from high to low volume applications. As well, he says the machine’s air blast system is more effective because it is easily adjustable in terms of varying wind speeds from the fans according to different crop growth stages. The Quantum Mist sprayer forms a critical part of the property’s machinery inventory and is used throughout the growing season. Most days, Dave’s son, Brody drives the tractor/sprayer combination, keeping a firm eye on the sprayer’s control systems. 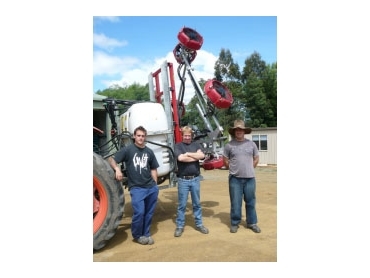 All in all, Quantum Mist sprayers have impressed the Jennings family which is based at Cygnet, the centre of fruit growing in the Huon Valley.